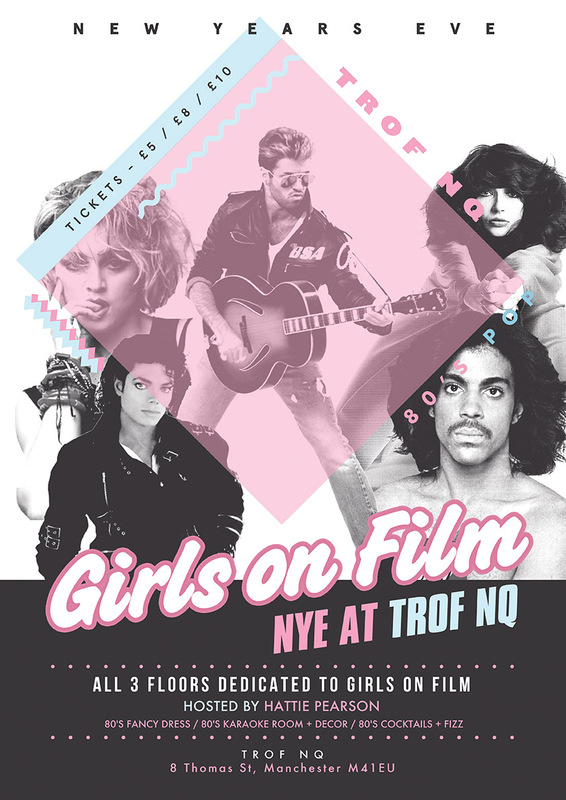 Everybody’s favourite 80’s club-night Girls On Film will be hosting a spectacular 3 floor take-over this NYE at Trof NQ. Hattie Pearson + Duncan (Whip It) will be on a mission to transport you back to a time where perms & Spandex were essential and everybody wanted to rule the world with a non-stop selection of the biggest hits from, quite possibly, the most outrageous decade ever. Girls On Film was created to let you explore your inner 80’s child. Usually taking place at The Deaf Institute where it holds a weekly residency, it’s an unrivalled 80’s party featuring shoulder pads, dapper lads and enough glitter to make Bruce Springsteen blush! The venue will turn into an 80’s haven, complete with 80’s decor, balloons, glitter station and an 80’s karaoke room on the top floor. Fancy dress is highly encouraged! !